Book of Revelation: “And I saw a new heaven and a new earth: for the first heaven and the first earth were passed away”. Book of Revelation 21:4 also says; And God shall wipe away all tears from their eyes; and there shall be no more death, neither sorrow, nor crying, neither shall there be any more pain: for the former things are passed away (This is the transformation process rebirth Phoenix Bird from a physical being to spiritual man (or a living stone). To him who overcomes I will give to eat from the tree of life, which is in the midst of the Paradise of God” (Revelation 2:4–5, 7). Superconscious Finally, if the collective unconscious is the water, the superconscious is the air above the iceberg. This is the “God mind” or the higher mind in nonreligious terms. This is the part of the human mind posited to be directly linked to a higher intelligence that, depending on one’s beliefs, exists within us, is external to us, or both. The superconscious transcends human consciousness and is our field of all possibility and potentiality. Some call it the quantum field, where nothing and everything exists at the same time as both wave and particle until we, the observers, serve to collapse the wave function and measure or fix reality into position. Until then, all is in a state of superposition. The superconscious is the superpositioned mind. Where the other levels of consciousness are closely tied into our physical nature, the superconscious goes beyond physicality. An interesting analogy for all of this comes from today’s obsession with technology. Imagine your own personal computer. That is your conscious, active mind. Your computer is linked to others all over the globe via the global “network” that allows you to converse with folks in other countries in real time and access almost instantaneously anything you want or need. That is the superconscious mind. Your computer runs on selected programs you chose to have installed with time and may have forgotten you did. That is the subconscious mind. Below all of this is the amassed collective of all of the information on all computers all over the world past, present, and future. That is the collective unconscious. The “higher mind” may or may not exist outside of the body/brain as a consciousness that interacts with our brains. This is the domain of universal consciousness, which we are all able to tap into for information we need. This mind knows nothing of linear time or the limitations of space, and is often described as “infinite mind.” Here, we find the highest levels of knowledge, creativity, spiritual awareness, oneness, wholeness, and connectedness with the All. Like the Bible’s Kingdom of Heaven, it is in and through us and all around us. But we don’t have to believe in a religious God to experience this open awareness and destruction of ego and separation. Where the collective unconscious is the deepest part of us, connected to the unconscious minds of everyone else that get their power from symbols and past programming, the superconscious is the highest part of us, connected to all the conscious minds as well as the mind of what created us: Source, God, Kingdom of Heaven, The Zero Point Field. It is a pure field or “grid” of potentiality from which we co-create our manifest reality. Some psychologists and scholars claim the superconscious and collective unconscious are the same, but in fact they are quite the opposite of each other. The superconscious knows all and allows us to access it by becoming one with a creative source or force. The collective unconscious is the land of hidden symbolic information of humanity through time, yet continuing to drive our behaviors and personalities below the radar and behind the scenes. Superconsciousness is God Mind. It is transcendent and divine. The collective unconscious is Humanity Mind. It is instinctual and primal. Both are critical to our understanding of who we are. As powerful and superior as this level of mind may be. we rarely use it. when we do, we are inspired, acting on what we sense is our higher selves or our creative source energy moving through us, speaking to us. Our conscious mind will often keep us distracted from the whisperings of the superconscious, and our subconscious and collective unconscious might even serve as gatekeepers that refuse to let us into the gates of heaven, so to speak. Acting to keep us afraid, in our comfort zones, safe, and curled into a little ball of habit, pattern, and self-sabotage, the other levels of mind will stop at nothing to keep us from experiencing more of the connection with the superconsciousness we seek in order to align ourselves to our purpose here on Earth. We can use many tools to reach the superconscious and soak up that inspiration and energy, but we first must deal with the deeper parts of ourselves that resist this because we might change—and change is scary. So whereas the superconscious may be the most desirable level of mind to experience, it is still the rock-bottom level of mind that is driving us away from that experience. That rock-bottom level is the collective unconscious, where we dance the dance of life immersed in universal beliefs, symbols, and ideas that may or may not be our own, may or may not serve us, and may or may not be in our best interest. Having a visual understanding of how the mind is structured and what each level is responsible for is helpful in realizing what makes us who we are as individuals and as a species. But it doesn’t go far enough to show us why we are who we are, and how we can make changes to ourselves and our lives that more fully reflect the truth and authenticity of the person we know somewhere deep within we can be. To do that, we have to step back from speaking the language of the conscious mind, which is focused on words, unexamined beliefs, thoughts, goals, and plans, and begin speaking the language of the collective unconscious. Think of it this way: if a diver wants to get the object on the ocean floor, he/she has to go all the way to the bottom. Unless it floats, it is stuck there in the sand and sediment to be pulled out and examined up in the light of day. To dive that deep, though, we have to learn to speak in symbols, and the most powerful of these are the archetypes. These mysterious and enigmatic symbols run our lives from their domain, or kingdom, and yet most of us have never even met or acknowledged them. Until now. The end goal was the transformation of the archetype that represented the totality of the psyche is: the self. SELF: This is the idealized, unified whole of our psyche that balances the shadow and the self, the anima and the animus. This is the real person actualized and was, to Jung, the ultimate goal of a human being and the greatest state of personal and spiritual achievement. The self is the unity of the personality as a whole, an entirety. Consciousness existed before the appearance of matter—before the appearance even of time and space. In this con-text, Pure Consciousness is not really even omnipresent: It simply is. It was vibrations of that consciousness that produced energy, and then, through grosser vibrations of energy, produced matter. Without these movements of consciousness, time and space wouldn’t exist. Only in humankind does consciousness reveal its potential for abandoning its material identity altogether. The fact that human beings seem to possess a capacity for increasing their awareness indefinitely suggests that they may even have the potential to continue that expansion to infinity. Rational thought suggests, and the experience of great mystics—the “scientists” of the spiritual world—confirms, that human beings, with their more highly refined nervous system, have the potential to transcend ego-awareness altogether, and attain cosmic consiousness. Subconsciousness lies, as the word implies, below the level of conscious awareness. Its physical seat in the body is the lower brain and the spine. The more our energy and awareness are uplifted in the spine and projected forward through the brain toward the frontal lobe, the higher our level of awareness will be. Concentrate in the frontal lobe of the brain, at a point midway between the eyebrows. The spine is the tunnel through which consciousness ascends to enlightenment. It begins from the dimmest awareness at the base of the spine, and ends at the seat seat of superconsciousness between the eyebrows (third eye). The subconscious, instinctive, or automatic mind. It controls the involuntary functions of the body; it is the seat of lower emotions and animal instinct, and it also carries on the auto-matic functions of our daily activities. Conscious mind or intellect. Intellect can control and guide the subconscious and is the basic requisite for the ego or “I” consciousness. Reasoning is the function of the intellect. Superconscious mind, or higher mind. The function of this mind, which is above intellect, is to achieve intuition and higher consciousness. Beyond these three levels of the mind is the pure consciousness known as spirit, soul, or self, which is formless, timeless, changeless, and infinite in its nature. Compared to the conscious mind, the lower self is superconscious. The Crown chakra and the Pineal gland is connected to the subconsciousness mind. A balanced flow of energy in this chakra may result in the ability to access both the subconscious and super- conscious minds. The superconsciousness is the bridge between your Divine Mind and your point of consciousness – the superconsciousness is the bridge to reaility. The superconscious mind, or Higher Self. The conscious mind, or middle self. The unconscious mind, or lower self. The superconscious mind is an aspect of Universal Consciousness and the Monad, it is the “inspirational body.” The Soul, the Christ Overself, and the Higher Self are aspects of the superconscious mind. The conscious mind is the middle self. It is the self-reflective analytical mind, or ego. The conscious mind has less information processing abilities than either the superconscious mind or the unconscious mind. The subconscious mind is an aspect of the middle self. The subconscious mind should not be confused with the unconscious mind, which is known to exist at a much deeper level. The lower self is the unconscious mind. It should be understood, however, that the lower self is anything but unconscious. Compared to the conscious mind, the lower self is superconscious, as it automatically processes a great deal of energy and information. The first three chakras constitute the spiritual consciousness of the lower self: Will, manifestation, and the connection to primal, creative life force Kundalini. What psychologists refer to as the subconscious mind is the intermedi-ary level between the conscious and unconscious minds. The super conscious mind is the higher level of personal consciousness with access to the universal of collective unconscious. It is where the ‘gods’ or powerful archetypes and spirit guides can be found. First, there is the superconscious mind. Our superconscious mind is located in our cell in the divine brain on the spiritual plane. Our superconscious mind is still directly connected to the Cosmic Consciousness, but we, our conscious self on the material plane, are separated from direct access to this superconscious mind due to the superconscious mind being on the higher planes and our lower, conscious mind being bound to the material plane. So the subconscious mind was brought into being to step down the high vibrations of the superconscious mind. The subconscious mind is a bridge between the superconscious mind and our conscious self, our conscious mind. It is through the subconscious mind, which steps down the full power of the superconscious mind, that we receive communication from our higher self. The subconscious mind then communicates with our conscious mind and conversely, the subconscious mind is the communications link between us, our conscious self, and the superconscious mind. This stepping down process is necessary or we wouldn’t be able to receive messages from our higher self that would be understandable. The subconscious mind has two functions. It is the controller of the automatic functions of the body and it is the connecting link between the conscious mind and the superconscious mind. The superconscious mind initiates ‘intuition’, or those impulses that impel us through life. The superconscious mind is constantly giving us impulses directing us to move out of our fallen state, the prison we are bound to on the material plane. The superconscious mind constantly sends impulses to our subconscious mind for us to move in certain desired channels and directions in life. Earth is symbolized by the soul. Since the subconscious mind works through symbols, it is important to cultivate the ability to interpret these symbols to decipher their meaning. The Philosopher’s Stone, and the secret of all secrets, and the gift of God. But it is difficult to discover the gift that is the philosopher’s stone and that exists in each one of us. The difficult part is uncovering the gift of the Philosopher’s Stone, which exists in each of us. It is sought by many and found be a few. It is beheld from afar and found near, fort it exist in every thing, in every place, and at all times. ‘THE SUBSTANCE OF THE UNIVERSE IS CONSCIOUSNESS. NOT MATTER. MATTER DOES NOT EXIST. IT IS ONLY A PERCEPTION. IT IS AN ILLUSION. ONLY ENERGY EXISTS. ENERGY VIBRATING AT DIFFERENT FREQUENCIES. CONSCIOUSNESS IS ENERGY. EVERYTHING YOU THINK EXISTS DOESN’T AND EVERYTHING YOU THINK DOESN’T EXIST, IS ALL THAT DOES. THE ONLY THING THAT EXISTS IS CONSCIOUSNESS. EVERYTHING IS CONSCIOUSNESS. YOU ARE CONSCIOUSNESS. You ARE EVERYTHING THAT IS. THERE IS NOTHING THAT YOU AREN’T. You HAVE NO IDEA HOW VAST YOU ARE BECAUSE YOU’VE SO LONG ACCEPTED THAT YOU ARE SMALL THAT THERE IS NO ABILITY IN YOUR MIND TO REALIZE HOW BIG YOU ARE. Look up into a clear night sky and it appears infinite. It is you. And you are vaster than what you can even perceive. Through human self-reflection, the universal force that is consciousness also self reflects to some degree. This is so because there are no real boundaries between human beings and Nature, other than those we impose. Humanity is an extension of nature and natural laws. This is why we are a medium for That Which Creates and Understands in the Universe. As a part of this creative Cosmos, we too create, self-reflect and come to know the Creator Within This is why one of the very best ways to know God, is through the knowing of self. Our daily reality is not only a matter of connection with God or Universal Consciousness. We are in fact actually composed of the same essence as that which is called God. In essence, we are as cells in the infinite body of Godt There are no ultimate boundaries in the cosmos The universe is actually composed of the very same underlying substance in all places peoples, and times. We are all ‘made of God, or in other words, Consciousness. In other words, the universal subconscious mind is the fabric of the universe, it is “prima materia” (or prime matter), which is an eternal process of becoming; the mental stuff from which everything springs. 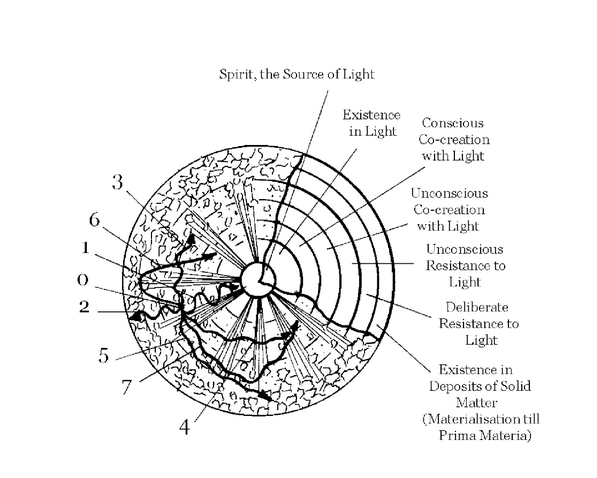 In Jung’s interpretation, the prima materia is some form of psychic energy, which contains the two opposites, the sun and moon or the conscious and the subconscious. We call the pineal gland our aging clock because it is the body’s timekeeper. We age because our pineal function declines over time, and as it does it produces less melatonin. This reduction in melatonin signals to the rest of the body that it is time for it to age. But if we reset our aging clock by taking melatonin, we can reverse those signals and stave off the downward spiral. Is this merely some vague and nonspecific promise of renewal? Research indicates that melatonin supplementation can forestall the very real and very destructive effects of aging, including weakened immune function, cancer, sleep disorders, and heart disease. The promise of melatonin may at first strike you as miraculous but there is nothing magical or mysterious about it. Melatonin works by restoring the function of the pineal gland, and thus it restores the balance to our body that we need to maintain the health we naturally enjoy in youth. The pineal gland is the “regulator” of the glands in our body that produce the hormones that run all our essential bodily systems. Are we just our Physical Bodies which we inhabit, or are we Supernatural Beings having a Physical Experience here on earth? What if we were far more then what we have been told and commanded to believe? Imagine if we discovered that we were Devine beings with extraordinary powers and capabilities of immeasurable, unlimited, infinite potential. How would this new found information change your life? Let’ s continue with this theme of imagining and say we discovered that our personal thoughts really do influence this seemingly physical world that we are experiencing. This would be a powerful skill and ability to possess and harness, allowing us to create and shape our realities. What if the ideas of “Space and Time were nothing more than conjured up concepts developed to control humanity in order to limit our infinite Wisdom and Power? These are just a few questions that have perplexed all of humanity from the beginning of our “Conscious Awakening” . We have grown accustomed to depending solely upon our five sense organs which seem to work well enough in this three dimensional reality, but compelling evidence is indicating that we are experiencing a holographic reality. Our understanding beyond this seemingly physical solid realm may not be as solid as we have been taught to believe, and so the concept of “Matter is brought into question and physics tells us that “Matter” does not exist. So how is it that we exist as matter? Albert Einstein alluded to this answer. We, the people of this beautiful planet, are really beings made of energy, but we exist at the 3rd dimension because our atoms have a specific frequency which makes us able to exist in this very 3rd dimension. This specific frequency is stable enough for all our lifetime. Using this information, if we are indeed capable of accelerating and decelerating the frequencies to make us able to exist in the 3rd dimension, then naturally, we can use this in order to travel inter-dimensionally throughout the infinite multiverse…and here lies the key to the true evolution of the human being race. Once we learn, or progress far enough, to accelerate and decelerate the vibrating frequencies of our atoms, then, in theory, we will be able to exist in the 5th dimension and in parallel universes of this wonderful multiverse. The inner consciousness itself, thus affecting the forms consciousness expresses itself within (the creation of the physical matter, emotional states, thought patterns, and temporal experiences). This light expresses the radiation in patterns and forms specific to the rules and structures (root assumptions) of the local system (cellular, individual, en masse, physical universe, or nonphysical space), while being inherently capable to express their pattern of frequency in an infinitude of ways. These rules and structures are plastic and capable of evolution. They stay in place to maintain a continuity of structure and rage of accepted experiences. Any change is a total change and the paradigm of experiences moves in totally new spheres of directions. The light within us is as wide and deep as we are capable to perceive. Put another way, our light in not governed by the same physical laws of time and space and is capable of reaching outward in continuous expanding ways in distances and achieve unimaginable levels of illumination. Perception is relative to our ability to focus the direction of the light. We perceive where our focus of attention gazes, while not negating the other directions our radiance emits to. What becomes available from allowing this inner light to shine brightly from within us? This light within allows us to embody our true nature we have become. That which represents our expansion will continuously seeks expression from this state of being. It orchestrates all things that is representative of our furthest most platform of becoming. Stations and stations of new insights and experiences become available. Our focus discriminates our direction we move in but it doesn’ t matter because we are within our light in any choice we choose. Our ability to thrive becomes more pointed as we actively practice tuning in to specific spaces. The light is a state of being capable of being carried and activated from situation to situation. It becomes a manifested goal and achievement like any physical creation. Yet this is the well of life and the tree of knowledge of sorts. The light we activate illuminates all things in our gaze. Our attention need only turn in a direction to begin to pierce through any surface to discover new intoxicating level of experience, exploration or insight. As we tune into our vortex, we allow our broader perspective to express itself in fuller and deeper ways. Our experiences then begin to more adequately express the nature of our becoming. More and more of our escrow reveals itself from the less inhibited space. The universe will delight in orchestrating all of the fabulous rendezvous that make up the total experience of our true nature expressing itself. Contrasts expansion is active and alive within us. The key that unlocks the manifestational door can only be activated through practicing our true nature’ s opinion through emotional terms. These characteristics and properties of the physical universe offers some assurance. I know in unmistakable terms that it is done. So I can take those goals off of the table as ulterior motives. I can erase them from my list and carry their essence in my heart. They are active and their existence has been established. Bring that established set point forward is a function of my ability to carry their tone and tune into their vibrational reality. The contrast only becomes an indicating feedback for my proximity to the treasure chest. We are vibratory light, manifested from the pure thought of the One. Light is the first creational tool. It is needed to shine on the screen of the non-vibratory construct. As we project our light through awareness onto this screen it reflects it back as creation. This non-vibratory informational construct that gives us our reality, is the earth matrix. Our higher selves are made up of the real light, not the reflection we see in our holographic world. They exist within our deep subconscious mind. The reality we experience is projected from our higher light, within to without. Our divine light is made out of particles of the creator. Through the energy of the One they start to rotate, through this action they emit light and vibrations which creates sound and color that is associated with these properties. The rotation also creates a magnetic field. These divine particles of light are made manifest from the mind of the One, therefore they are intelligent. All intelligence has awareness as one cannot exist without the other, thus they are vibratory thought. In order for the game of creation to operate these particles of light need to interact with a form of intelligence, to learn and evolve. This is the reason for creation, without it there would be no purpose. A construct of intelligence in the form of non-vibratory information is used as the learning tool. Since it does not vibrate it does not emit light and is therefore dark. This is where the two forces of light and dark originate from. The human characters we animate through our divine light are a part of this non-vibratory informational construct called the earth matrix. The ego is the awareness of an individual separated human; it sees everything through this perspective. This is where the conflict that is played out between the higher self and the ego is created, or what is often called good and evil. It is the awareness of unity and the unawareness of it. In this game of creation the two forms interact. The vibratory light is the non-physical and the non-vibratory reflects the illusion of the physical as the light is reflected off the screen of the non-vibratory. The vibratory thought energy vibrates the non-vibratory and animates it as it starts to vibrate. The rule in creation is, the higher the vibration the more light that is refracted and will dominate its impression on what refracts less light and vibration and have more influence over it. The vibratory particles of light through the action of their rotation create energy through their motion. The energy and motion generate emotion or e-motion. The emotions of joy, ecstasy and happiness are of higher vibrations and generate more energy. The emotions of fear, greed and hatred are of low vibrations and energy. As the higher selves plug into the earth matrix they activate the thought program of the human being and interact with creation through it. The human being operates between these two opposite poles of light and dark. If the human vibrates at a low vibratory rate the earth matrix will have more ability to influence its desires onto it. If the human being can increase its rate of vibrations it can impose more of its desires into its creation. Through synchronizing your vibratory rate with that of your higher self, beautiful and better worlds will open up for you. It is about taking the whole of this physical universe and moving it back up the Ladder of Creation (or Tree of Life) to return it to the rarified and super conscious dimensional levels that exist just beyond our normal work-a-day consciousness. The “One Soul” he often refers to when trying to explain his gift, is part of everything in the universe, unlimited by time and space. … The superconscious is linked to the consciousness of the One Soul, the source of all Wisdom coming from God. The primitive man, connected to the world of plants and animals, has evolved to the point where he, his consciousness, is capable of “taking” the divine element. However, the current stage is not his final, finished state. We are creatures still inhabiting physical bodies, which are subject to destruction. Only when mankind has reached its “winged” (spiritually speaking) form, can it rejoin the One Soul. The “I” with its subjective forms of perception (which can be conquered through clairvoyance) will disappear forever. Thus all people are brethren, striving for the evolution of the soul toward the divine. You’re made up of Consciousness, which is what we called “INFINITY”. You have a mind (and EGO is the center), and a body, which are your tools for accessing different forms of reality. The mind and the body have many levels and many dimensions. So, you the “CONSCIOUSNESS”, “INFINITY”, has a mind and a body which have many levels and dimensions. The average human being is only aware of two dimensions. The human dimension (physical world) and the dream dimension (spiritual world). And their minds are also your higher minds: The Super-conscious minds. Why are you not aware of this? Because your Consciousness is limited by your human mind! Your human thoughts, mind and body are blocking your awareness of these other higher parts and dimensions of you. To become aware of the higher dimensions of your being, (your higher self, other parts, beyond your humanity) you must go beyond your human mind and body. God is a symbol that represents Consciousness or INFINITY. Consciousness, the essence of the self which thinks and feels, regardless of whether or not we are incarnate in a physical body, resides within the DNA of the human body. This means that we have to change our DNA in order to shift consciousness, and it also means that when we change our consciousness, we change our DNA_ From the old world view scientific perspective, the idea of being able to change our DNA is considered impossible. Too many of us have been brought up with the understanding that we inherit our DNA from our parents and are stuck with those aspects of being human. We cannot discount the facts of our existing bodies, but we can begin to change our thinking to accept that we can — and do — change our physical bodies on a day to day basis. Because change happens cell by cell, we often don’ t notice it until sufficient cells within a specific organ of our bodies have changed. This creates a very noticeable effect. Nothing in the human body is static and every single one of our cells is renewing themself, or dying, all the time. The author and endocrinologist, Deepak Chopra, popularized this notion of mind body medicine in his book ‘Ageless Body, Timeless Mind’ and ‘Quantum Healing’ , among others. It is so much more beneficial for us to change the patterns of our cellular behaviour consciously, rather than let the cells continue to respond to the influences of our subconscious minds, or our unconscious, minds, as well as the myriad of influences from the environment and people around us. Changing cellular patterns amounts to reprogramming the cells. As they respond to the vibrations of our new, consciously created, habits of thought and emotion —especially high frequency ones such as love, peace, tolerance and compassion —they themselves harmonically resonate with these created vibrations. This amounts to the development of new habits of cellular behaviour. And thus we evolve, by choice. In support of DNA changes, we can easily utilize high frequency outside sources of information to raise our resonance. With these high frequency vibrations coursing throughout our bodies, we naturally supply the necessary information to our cells that enable them to change the way they do things. Cells readily respond to anything of a higher frequency nature than themselves, because all living organisms will be drawn towards anything of a higher order. If a raised resonance vibration is maintained within, or repeated often enough, it becomes the new order within. This higher level of cellular functioning naturally creates a better quality of life, overall. The consequence of reprogramming our cells is that we will increase our awareness of what is already out there. In this way we trust the process of life more easily, we go with the flow of life more easily and we create what we want more easily. This all amounts to the collapse of resistance and the acceptance of our creative abilities. Life becomes happier and easier, and health, joy, abundance and love flows from this.